The Zoology of the voyage of H.M.S. Erebus and Terror, under the command of Captain Sir James Clark Ross, R.N., F.R.S., during the years 1839 to 1843. London: Longman, Brown, Green, and Longmans, 1844[-?1848]. Selection of parts from the 2 volume set bound in one, 4° (307 x 243mm). Letterpress section title. Hand-coloured lithographic map, 153 lithographic plates only, 41 hand-coloured, by B.Waterhouse Hawkins, W.Wing, W.Mitchell and J.Ford, printed by Day & Haghe, C.Hullmandel or Hullmandel & Walton. (Some spotting.) Contemporary green half calf gilt, four original upper part wrappers bound as section titles (spine lightly soiled, extremities scuffed). Provenance: William Willoughby, 3rd Earl of Enniskillen (1807-1886, armorial bookplate). A SIGNIFICANT PROPORTION OF THE RARE ZOOLOGICAL RESULTS FROM ROSS'S VOYAGE TO THE ANTARCTIC WHEN HE REACHED 79°09'30"SOUTH. 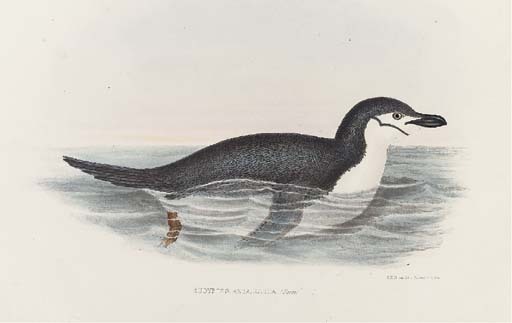 The complete zoology results were published from 1844 to 1848 and then 1874 to 1875: the present selection includes an almost complete collection of all the material published in the 1840s; sold not subject to return. Cf.Anker 185; cf.BM(NH) IV,p.1698; cf.Hocken 117; cf. Nissen IVB 390 & ZBI 1696, 1703, 3386; cf.Spence 971; cf.Wood p.536.